Luke is an accredited exercise physiologist and is a current member of Exercise Sport Science Australia (ESSA) with an established interest in musculoskeletal rehabilitation, corporate exercise programs, VO2 Max testing and prescribing exercises for the management of chronic diseases. As a qualified Workcover NSW Service Provider, Luke continually applies a multidisciplinary approach to musculoskeletal rehabilitation in the treatment of injury. Luke is currently involved in assisting companies such as TNT and Riteway Express in implementing programs to minimize workplace injuries and increase productivity with great success. Luke is currently involved with the Penrith Panthers junior representative football teams in looking after soft tissue injuries and progressing injured players back to the field. 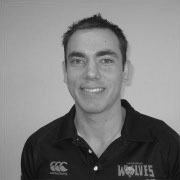 He is also the Strength and Conditioning coach and on-field trainer with the Windsor Wolves Bundy Cup side. Luke has also previously lectured at the Australian Catholic University. In his spare time, Luke likes to remain active and exercise regularly, as well as participating in cricket, basketball and golf.